A former lawyer for Leigh Corfman, a woman who has accused Roy Moore of sexual assault when she was 14 years old, claims that, in exchange for discrediting Corfman’s allegations and dropping her as a client, he was offered $10,000 and networking opportunities with Steve Bannon. Which is sort of like being offered $10,000 and then throwing in a hot tub of shrieking eels, but one’s woman’s trash is another man’s treasure, I suppose. In any case, he declined. The Washington Post has conducted a fabulous novelistic investigation replete with fuzzy footage and recorded phone calls and a handwritten note on physical paper (which is just exciting). Attorney Eddie Sexton has supplied the Post with records containing offers by Moore acquaintances: business partners Gary Lantrip and Bert Davi, both of whom attended at least one Moore fundraiser at which Bannon was present. In a recorded phone call, Lantrip mentioned “the ten...dollars,” which Sexton claims refers to a $10,000 bribe. “What they’re saying, all they want to do is cloud something,” he allegedly told Sexton, referring to casting doubt on the allegations. “They said if they cloud, like, two of them, then that’s all they need.” Lantrip further dangled the possibility of setting Sexton up to work with Bannon on Breitbart’s growth into Alabama. The episode is complicated by overlapping relationships; Sexton has also represented Davi and Lantrip and is longtime friends with both Lantrip and also with Moore accuser/then-client Corfman. After reviewing the allegations, after taking Leigh Corfman as my client, I believe there is not sufficient evidence to back them up and that the case strains credulity. I decided that since I would have difficulty represent a client that don’t believe I have to recuse myself from this case. I hope Leigh the best. Afterwards, Sexton began recording calls and messages with Davi and Lantrip in fear of a potential legal debacle. 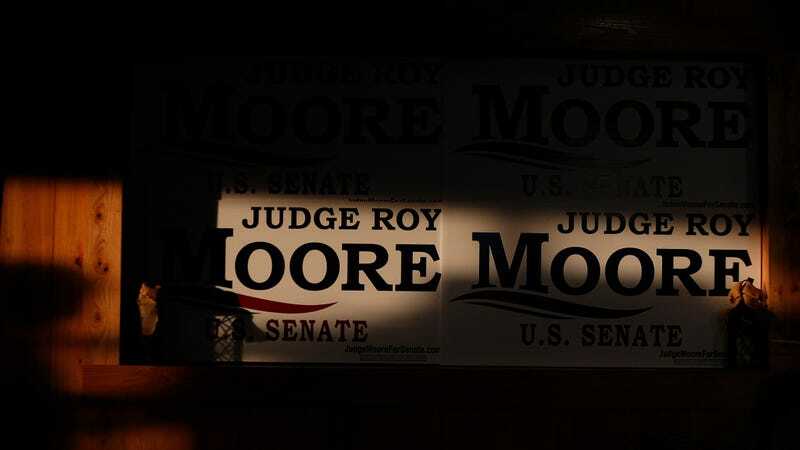 Moore tells the Post that the campaign never offered money “to say something untrue,” and a spokesperson acknowledged that while they were acquainted, Lantrip and Davi were never involved with the campaign. Bannon was unable to be reached for comment. Moore responds that she (and unstated but by implication, several other women) are attacking him (with unholy blaspheme and all the rest). When asked by Jezebel, Corfman’s present attorney Neil Roman declined to comment.